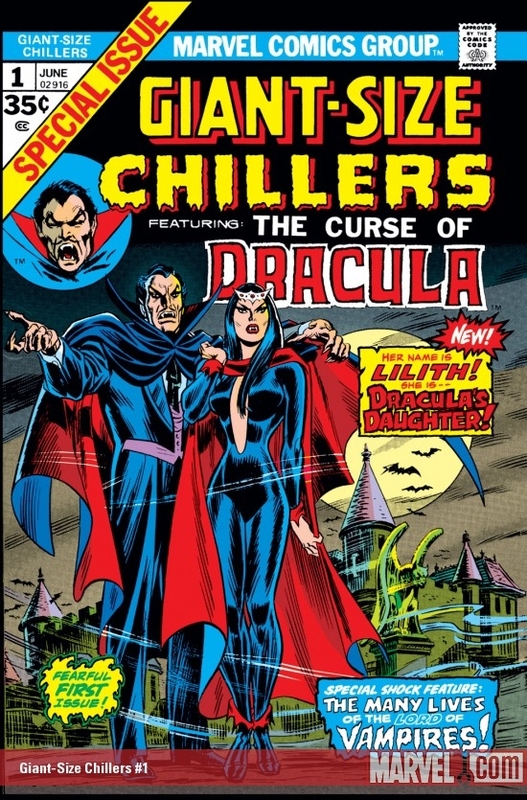 "Featuring the Curse of Dracula"
Why is GIANT SIZE CHILLERS #1 cool? 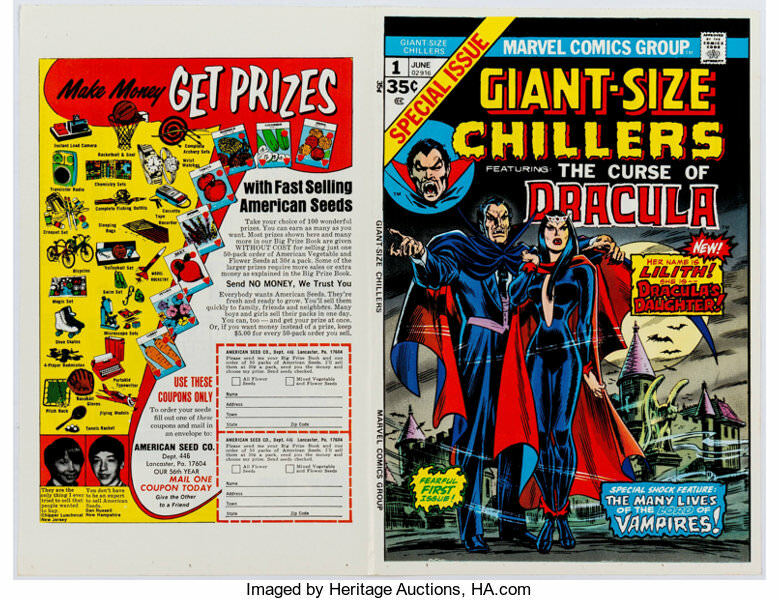 Giant Size Chillers #1 is a 1974s comic that is a spin off the then popular Tomb of Dracula series. It marks the first appearance of Lilith the daughter of Dracula and it is the first of the Giant Size Chillers, which pop up from time to time afterward. This is also one of the first horror comic one offs to have appeared in awhile as horror had previously been highly restricted. Tomb of Dracula is a very interesting series. The major publishers had been strictly prohibited from making horror comics for years. 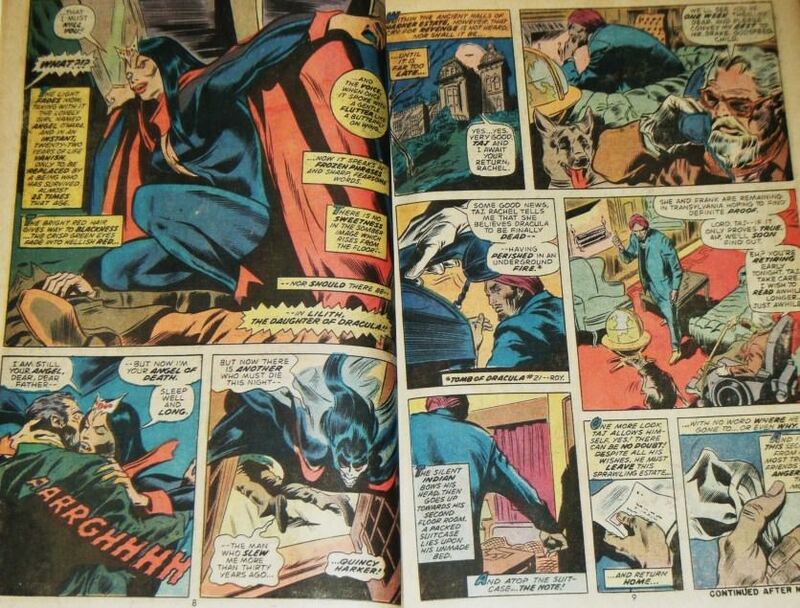 Then in 1971 the comic's code authority allows publishers to begin making stories about vampires. Marvel tests the waters with a quasi vampire character Morbius in 1971 who appears in Amazing Spider-Man #101. When that character goes the rules without a hitch they decide to push a little further with a horror themed comic based on a vampire. They base the new vampire series around biggest name vampire of them all, Dracula and in 1972 Tomb of Dracula is born. The series gets off to a bit of a rough start having different creative teams cycle in and out over the first 6 issues but Tomb of Dracula #7 (Still in 1972) Writer Marv Wolfman and Artist Gene Colan are combined on the series and they become creative core of the book for the rest its historical run. Not only was it one of the first Horror series released after the easing of restrictions but it was also one of Marvel's longest lasting. It is known for being the longest lasting comic with a villain as the main character in Marvel history with its run of 70 issues! It also introduced the hero Blade with Tomb of Dracula #10 who became one of the first African American heroes. Giant Size Chillers appears in 1974 still early in the Wolfman run but after the series found its stride. The goal of the series is to have a fun one off tie into the Tomb of Dracula series. It is designed a little deeper into Dracula and debut a new characters his daughter, Lilith. The book not only introduces Lilith but it also reveals her origins and in doing so some of Dracula's as well. Now for Giant Size Chillers! In London, Angel O' Hara a pregnant young women is being yelled at by her irate father. She has just revealed that secretly married and is pregnant. The irate father kills her husband. This makes Angel extremely angry and attracks a spirit with a similar feeling at rage. This spirit is that of Lilith who also hate her father. Angel is overcome and turned into Lilith who quickly kills Angel's murdering father. Lilith then sets out to find vampire hunter, Quincy Harker who had killed her 30 years prior. She dispatches of Harker. She then goes off to confront Dracula himself. Meanwhile, Dracula has an interesting meeting with Sheila Whittier an owner of a haunted castle. Rather than simply kill her Dracula comforts the woman and promises to help her solve the castle's secrets. Dracula and Lilith then run across each other and chase each other through London as bats. They stop at a soccer game to discuss their histories. This is where we learn the origin of Lilith. As a man, Dracula is forced to marry Lilith's mother by his father. Dracula loathes Lilith's mother. The two have a child but as soon as Dracula's father dies he leaves them. Dracula goes off and marries his true love and starts a new family. Lilith scorned by her father finds her self living with a witch. The witch also does not like Dracula and curses Lilith. Lilith becomes a quasi vampire who is destined to battle her father, forever. She can not die fully until her Father is destroyed. The two leave each other without working out their differences. They both seem to agree that they dislike eachother very much. Dracula returns his sight toward the haunted castle where he find that Lord Henry is using dark magic to make the castle appear haunted. Henry kills himself but Sheila will continue to live on in the castle and wonder about its mysteries. Lilith goes on to reappear in some Dracula stories as well as reappear in Nick Fury's Howling Commandos.